Now first things first, NVIDIA made a really weird move with the naming scheme by ditching the GTX 990M name and going simply with GTX 980. But I guess it wouldn’t confuse consumers as this part is specifically aimed at gaming laptops and the difference between the GTX 980M and GTX 980 is denoted by the labeling. 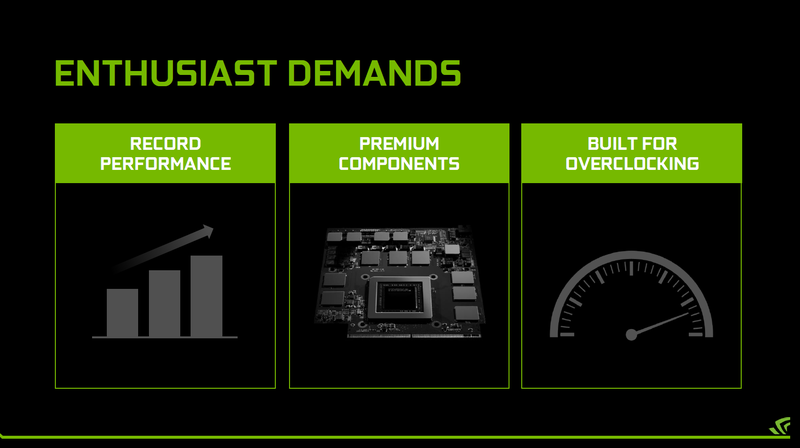 The GTX 980M is purely a mobility focused part and has been the fastest solution for the market without a doubt since its launch. 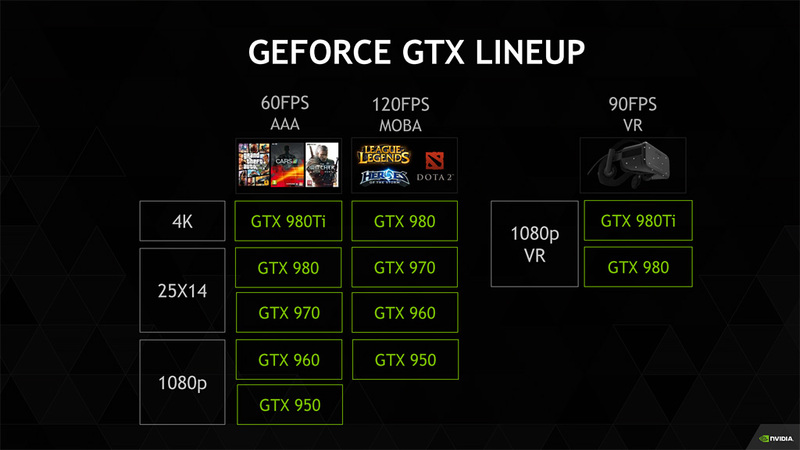 The GeForce GTX 980 is simple, by calling it that, NVIDIA assures that users get the consumers should expect the same performance as the desktop class GeForce GTX 980 and there’s a lot going on inside the GTX 980 (Laptop SKU) than the GTX 980M. The GeForce GTX 980 is actually a full GM204 GPU with the same specifications as a GeForce GTX 980 graphics card that is a high-performance desktop class graphics card. The GeForce GTX 980 comes with 2048 CUDA cores, 128 texture mapping units and 64 raster operation units. 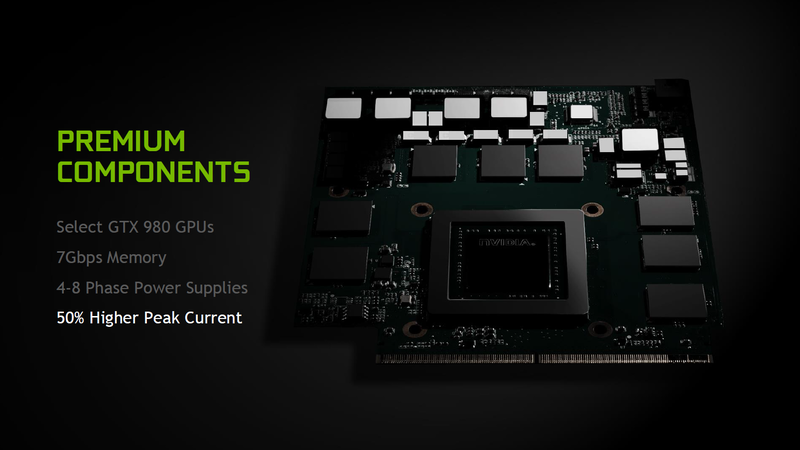 The GeForce GTX 980M featured 1536 CUDA cores, 96 texture mapping units and 64 raster operation units. The 980M was clocked at 1038 MHz while the 990M will have a higher clock speed of 1126 MHz base and 1218 MHz boost clock. 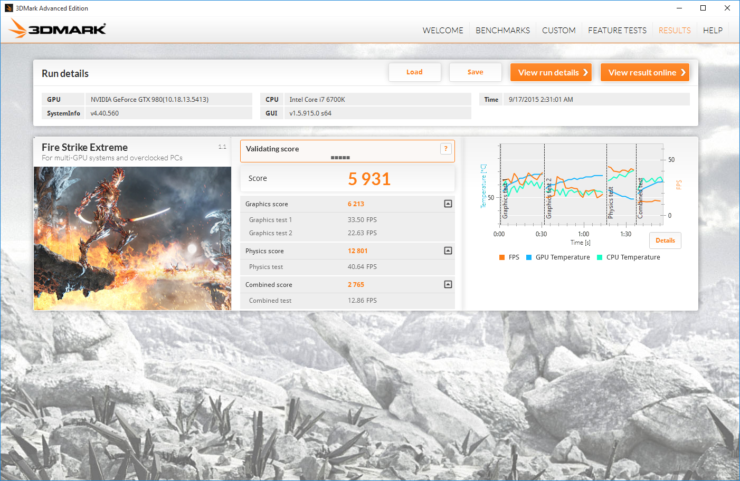 The desktop class GeForce GTX 980 is also clocked at the same speeds of 1126 MHz base and 1218 MHz boost. 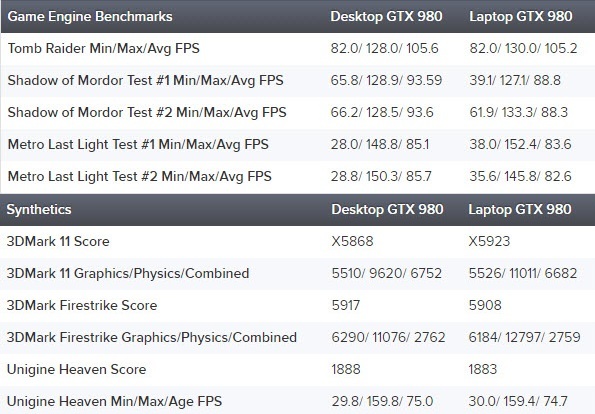 So one thing is confirmed, the GeForce GTX 980 is as fast as the desktop variant and around 35% faster than the GeForce GTX 980M. Additionally, we are looking at 8 GB of GDDR5 memory that operates along a 256-bit bus and clocked at 1753 MHz (7.00 GHz effective) clock speed to pump out 224.0 GB/s bandwidth. The GeForce GTX 980M also had a slower 5.0 GHz memory clock that pumped out 160 GB/s bandwidth and came with a smaller 4 GB GDDR5 VRAM.The GeForce GTX 980 has a TDP of 165W, the GTX 980M has a TDP of 125W while the GeForce GTX 980 (Laptop SKU) will have a TDP around 125W – 150W (configurable by OEM) since NVIDIA is using quality GM204 chips with the very best silicon and configuring the voltage accordingly to meet the performance demands. In fact, the GTX 980 uses a specialized MXM PCB board that comes with 4 to 8 Phase PWM supplies and deliver 50% higher current than the GTX 980M boards. 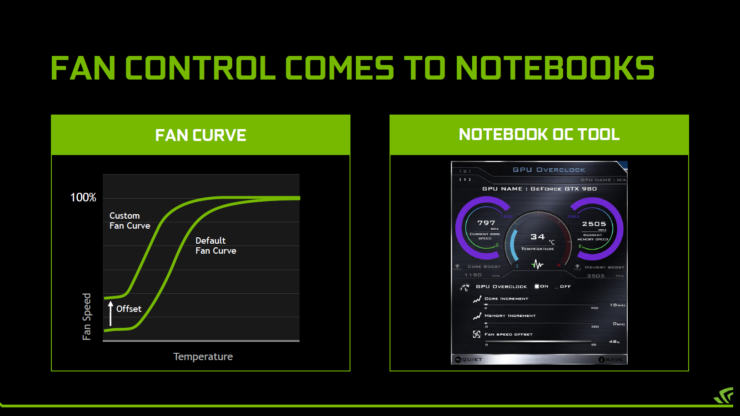 With higher current input and an enthusiast focused design, NVIDIA will be offering full overclocking support on laptops with the desktop-class GTX 980. This GPU is said to gain an additional 10-15% performance uplift under overclocked conditions, reaching clock speeds past 1400 MHz on core and 7.5 GHz on memory. There’s also a possibility to see SLI configurations of such cards used inside high-end laptops though you might need some hefty cooling designs such as the water-cooled ROG GX700 series laptop if you’re going to purchase one. 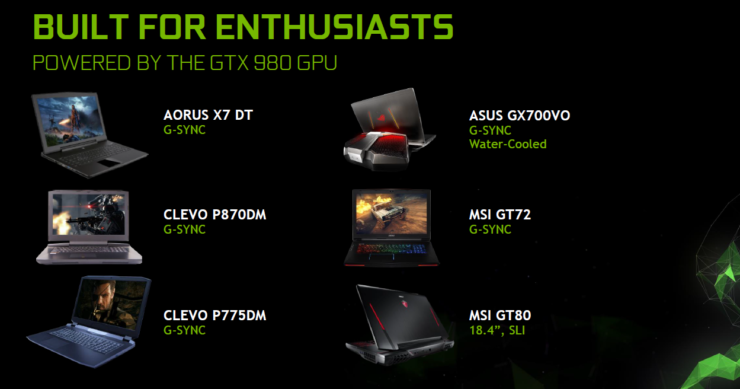 The GeForce GTX 980 is really going to make a difference when it enters in the mobility market fused inside high-end laptops such as the ROG GX700 series. Coupled with Unlocked Skylake, Skylake-H series CPUs and even liquid cooled options, we will see a range of new and enthusiast grade products soon in the market. Laptop makers and OEMs will offer several new designs and ASUS, MSI, AORUS, CLEVO already have designs ready to go in market later this year. 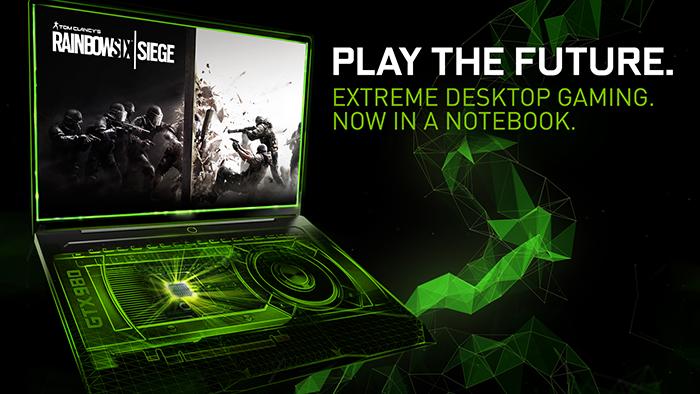 The new designs are said to be 2 times more cooler than regular laptops with bulky designs. 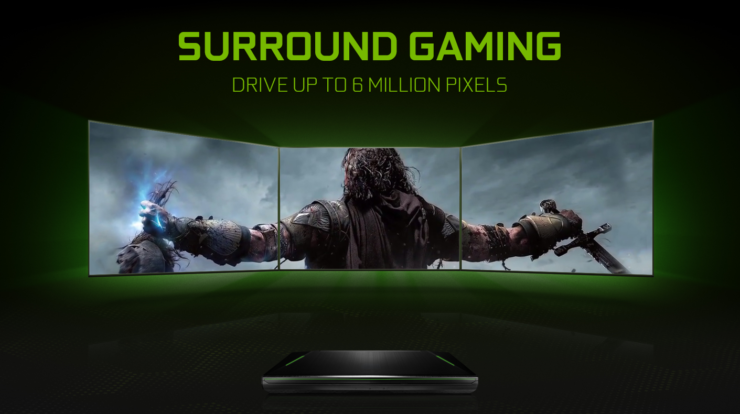 This also brings laptop users on the same path to VR as desktop gamers since NVIDIA had already recommended GeForce GTX 980 for 1080P Virtual Reality gaming at a smooth and steady 90 FPS. The future looks really bright for mobility gaming as Maxwell as an architecture has proven to be a marvel for mobility platforms and with HBM coming to more mainstream cards, we might see even better performance in the future from gaming focused laptops. 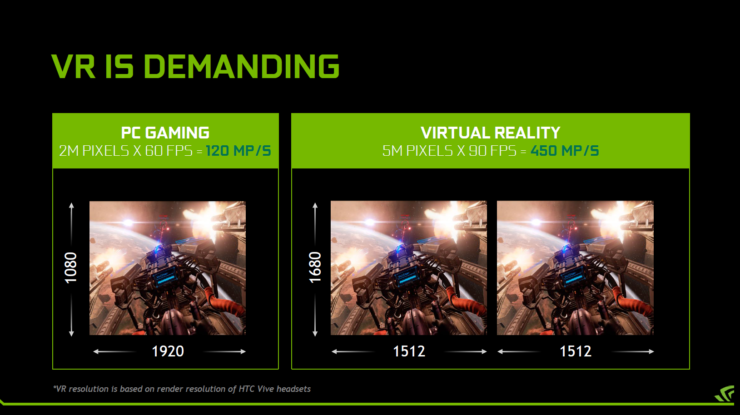 As mentioned, we are looking at around 35% performance increase over the GTX 980M which is already a really fast mobile solution but NVIDIA took it one step ahead offering the recommended requirement for VR Gaming and Surround Gaming on laptop platforms. 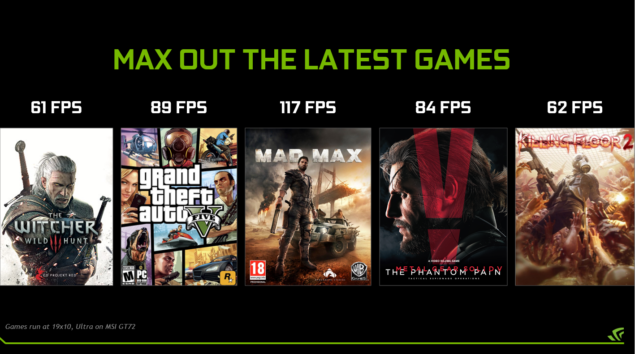 The GeForce GTX 980 delivers smooth 60+ FPS in titles such as GTA V, Witcher 3, Metal Gear Solid: Phantom Pain at 1920×1080 with maxed details and above 100 FPS in the Mad Max AAA title using the same settings which is awesome for laptop gaming. 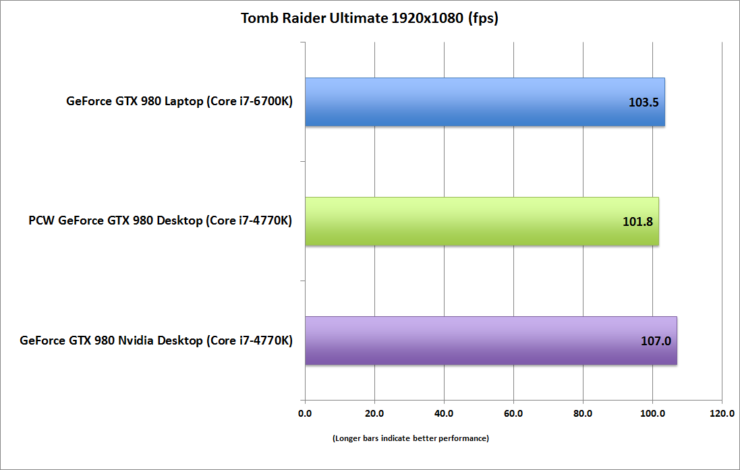 Some performance results have also been posted by tech sites that include PCWorld and Eurogamer that show both desktop and laptop GeForce GTX 980 cards performing on par with each other. 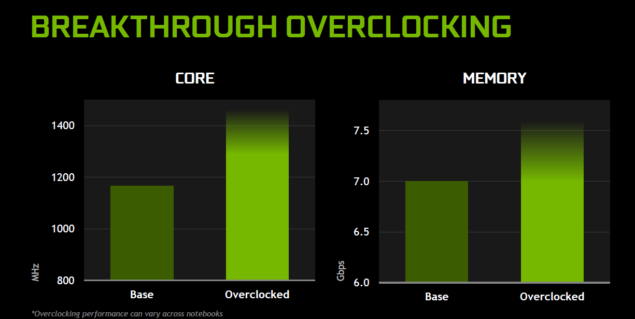 There’s no difference at all between the two cards which confirms that NVIDIA has achieved performance parity with their desktop and laptop class GPUs. This also calls for an action from AMD as they have been out of action from the mobility space for a while now. AMD’s last graphics card, the Radeon R9 M295X and R9 M395X are the only new Tonga (2048 Cores) powered options while the remaining lineup remains to use older GPU cores. AMD has shown how far their Fiji chip can scale but its not possible at the moment to fused HBM grade GPUs on MXM boards since they require different circuitry and board designs. NVIDIA’s entire GeForce 900M series mobility lineup is based on new chips and for AMD, it will take at least a year more to release more chips based on their latest GCN architecture that will be made using FinFET process node, delivering better efficiency and greater transistor density.